Could technology be used to combat election rigging? Following the US, the EU and Japan refusing to verify Cambodia’s disputably flawed elections, could technology be used to provide a corruption proof voting system? Electronic voting is currently being used in two different forms, utilising electronic interfaces that voters interact with to cast votes, and fully integrated online voting systems that minimise expense by acquiring electronic votes and then accumulating them online. Both forms have been criticised heavily for placing issues of election expenses above election security. Security experts have argued it isn’t just the issue of data manipulation that is the major problem here, but also the added complexity of possible computer malfunction that could colour the outcome of the election. Utilising blockchain has also been suggested for encrypting and maintaining a more accurate register of votes. However security experts remain sceptical of the application of blockchain to the voting process also, as although it may make the process more accessible to public scrutiny, it will not address the problem of either complete invulnerability to hacking or computer malfunction. As the addition of blockchain would affect the storing of the data not the data gathering process, it would still be susceptible to tampering and malfunction and probably be more complicated to rectify, much in the same way that 750,000 bitcoins were famously stolen from the Mt. Gox exchange in 2014. The computer security community are unanimously against online voting as voting machines themselves remain vulnerable to attack despite the methods used to store and analyse the data. The vast majority of networked electronic voting machines have been criticised by computer security experts, many of whom remain ardent critics of bringing voting online as regardless of the sophistication of the technology involved, there are inevitably insecurities of the technology that could be manipulated. This makes the implementation of recent innovations such as blockchain pointless, as even if intentions are good, individual units of a network collecting votes may not be fully protected from interference, inescapably leaving the voting process vulnerable to attack. Estonia and Switzerland are the only countries, out of all the countries that have started to implement electronic voting in some way, to have conducted surveys to determine the multifaceted effects electronic voting has on the voting process. These studies have shown that, far from making the voting process fairer and open to all; electronic voting seemed to yield a disproportionate number of younger, richer, more tech savvy voters. Also the total voter turnout seems to be unaffected or actually decrease when voting is electronic. It seems electronic voting, far from alleviating problems from the voting system, seems to actually generate new ones. A study published by the Central European University in Hungary analysed the 2007 Estonian parliamentary elections that utilised remote electronic voting, giving voters the choice between a traditional ballot or an internet poll. The paper shows that despite the method being put in place to increase voter turnout, it had little effect on the overall turn out, with the vast majority of voters being the same politically engaged citizens that cast votes normally. However, the study also found that during the 2007 election there was also a higher voter participation in high income areas and from individuals with a formal education, indicating a greater digital divide following the introduction of electronic voting. What on paper may look like an improvement is currently not the reality, more may need to be done to iron out the creases in the inevitable marrying of voting and technology but one thing is sure, more studies on the effects of electronic voting need to be carried out alongside the adoption of technologies. Although a Swiss study of online voting in two cantons in 2017 showed that there was no effect on the voter turnout, the same study indicated that this is a finding that may be changing over time. Electronic voting will certainly be introduced in the wider world, but the social impact shouldn’t be ignored, to advocate a slow introduction of tech into the voting process along side traditional paper ballots as it is being done in Estonia would be best practice. The process may be more expensive but it will allow this inevitable process to take place in a fairer and more honest way, taking care not to leave certain demographics behind. 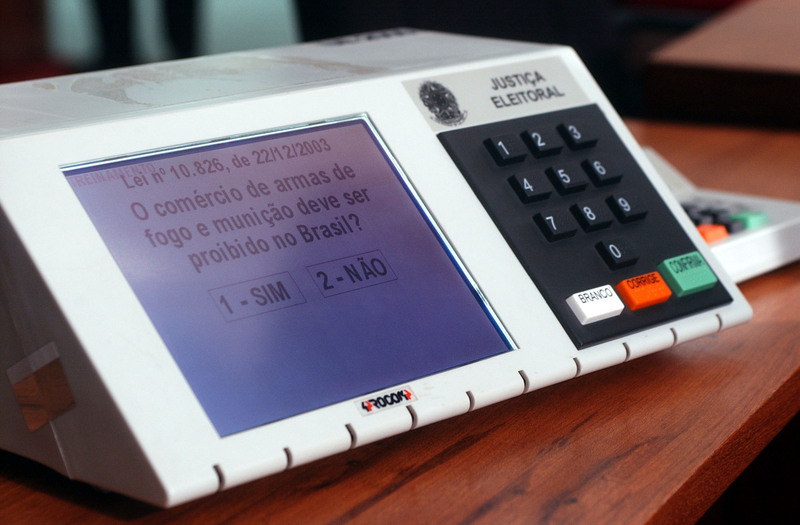 Electronic voting systems are already being utilised in India, Brazil, Venezuela and the United States. However Estonia is leading the way with internet based electronic voting systems, something also seen in Switzerland and parts of Canada, France and the US. However the methods currently implemented have been criticised as still being susceptible to fraudulent activity, and they may not protect voter anonymity while maintaining result transparency. Blockchain could be utilised to have a verifiable decentralised database of votes. The decentralised secure ledger that blockchain technology provides would allow the record of votes to be kept secure and identical on a wide group of computers or servers. The cryptographic nature of blockchain could guarantee voter anonymity while supplying a system that is fully open to public scrutiny. This would allow voting to become tamper-proof, transparent, more accessible, more affordable and tension-less. As mentioned above Estonia have gone further than most other countries in implementing internet voting, even using blockchain solutions in the process. A NASDAQ subsidiary built and operated web-based user interfaces used in the country, while the Estonian government have utilised the widely distributed unique national ID cards to verify voters, in what is in essence an extension of a postal vote. While blockchain may not solve all of the security issues surrounding electronic voting, it is an essential tool to building a clearer, fairer and easier voting system. In the example of Cambodia, it wasn’t so much the faking of votes that was the problem but the intimidation of voters and the imprisonment of the government's main opposition. What can technology do that it already isn’t to stop this from occurring? In fact, in these situations electronic voting may amplify intimidation and fear, as a proportion of all societies will inevitably not understand how electronic voting systems work. These individuals may therefore feel more overwhelmed and intimidated by questions of security and potential loss of anonymity. Following relatively free and fair elections in 2017, the Cambodian government dismantled the opposition and imprisoned its leader on charges of treason. While this in itself may serve to intimidate voters into voting a certain way, Prime Minister Hun Sen’s bloody coup to maintain his grip on power in the 90’s, and election irregularities in 2013 further instil distrust in the voting process also. While technology can potentially be utilised to deal with these issues of corruption as well, technology currently used in the voting process does not come close to addressing issues such as these. Voter intimidation is an aspect of election rigging that remains unaddressed. Any use of technology may amplify voter’s fears unless effort is taken to fostering a culture of clarity and understanding. Electronic voting may minimise the possibilities for ballot stuffing and be more cost effective, but if falls short of addressing societal issues such as voter intimidation and corruption issues such as the imprisonment of opposition. More needs to be done to support a culture of transparency, clarity and good sportsmanship/honourable conduct around voting to fight corruption, at the end of the day election rigging is just a tool used by the corrupt to perpetuate their corruption.